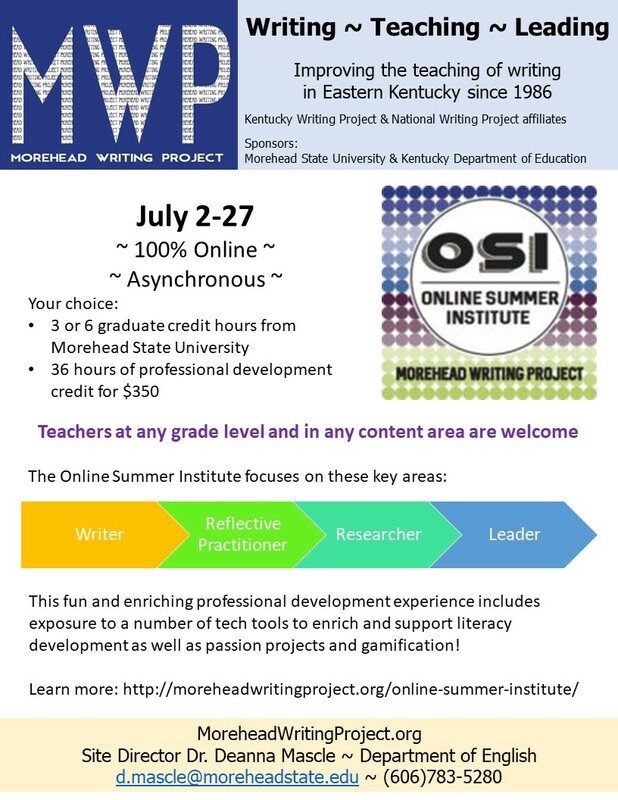 The Morehead Writing Project’s eighth Online Summer Institute will be held during Summer II in 2018 (July 2-27). The Online Summer Institute will offer a choice of three or six graduate credit hours from Morehead State University (ENG 608 and ENG 609) or 36 hours of professional development credit for $350. The Online Summer Institute includes many of the same experiences thanks to the opportunities that technology offers. The Online Summer Institute also offers unique experiences as the teachers who participate are not bound by geography to the Eastern Kentucky region. This is a fun and enriching professional development experience that includes exposure to a number of tech tools to enhance and support literacy development as well as passion projects and gamification! Teachers at any grade level and in any content area are welcome. Contact Morehead Writing Project Director Deanna Mascle (d.mascle@moreheadstate.edu) to learn more. Students can register for one or both Eng 608 (3 hours) and Eng 609 (3 hours) classes at Morehead State University according to their program needs. Those interested in simply earning professional development can register online by June 15 and we will be in touch regarding payment (due July 1). Note: Morehead State University graduate credit is $579 per credit hour (for 3 or 6 credit hours) OR Morehead Writing Project can offer up to 36 hours of professional development credit ($350). Contact us for details. To earn graduate credit, participants must be Morehead State University graduate students. To earn professional development credit, participants must register online by June 15 and we must receive either a check, purchase order, or credit card by July 1. All participants are required to sign up for either graduate credit or professional development credit. This is not a free program.